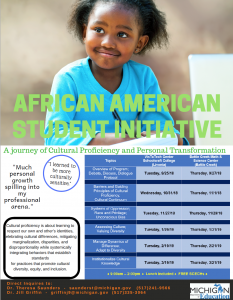 Cultural proficiency is about learning to respect our own and other’s identities, celebrating cultural differences, mitigating marginalization, disparities, and disproportionality, while systemically integrating behavior that establishes standards for practice that promote cultural diversity, equity and inclusion. Increased human capital as it relates to equity for students, their families, and educators. Increased social capital through the development of a learning community. Increased decisional capital through the creation of an action plan for transformational change in the school community. Increased staff cultural competence through pre- and post- surveys. Increased trust through improved cross-cultural communication skills. When: September 27, 9:00 a.m. to 2:00 p.m.
All sessions will be held from 9:00 a.m. to 2:00 p.m.; lunch is included. For more information, contact Dr. Theresa Saunders via email or at (517) 241-9566 or Dr. Jill Griffin via email or at (517) 335-3064. Click here to download a flier.